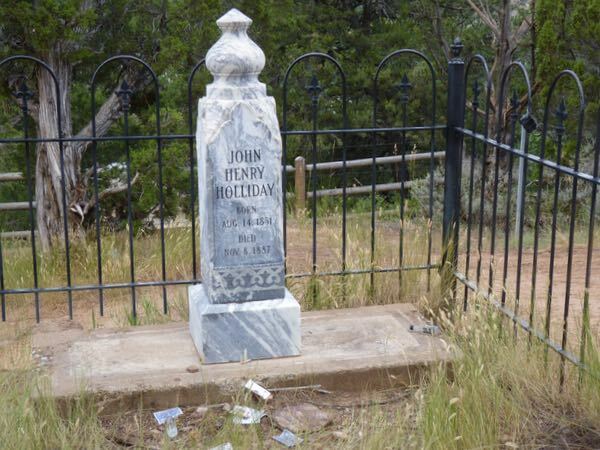 Linwood Cemetery, high atop a hill overlooking the valley, was the final resting place for two of the west’s most infamous gunslingers; Doc Holliday and Kid Curry. Realizing their graves could attract tourists, the town and historical society erected markers for them. It was a somewhat steep 1/2 mi hike up to the pioneer cemetery. Getting the deceased up there must have been a real ordeal. 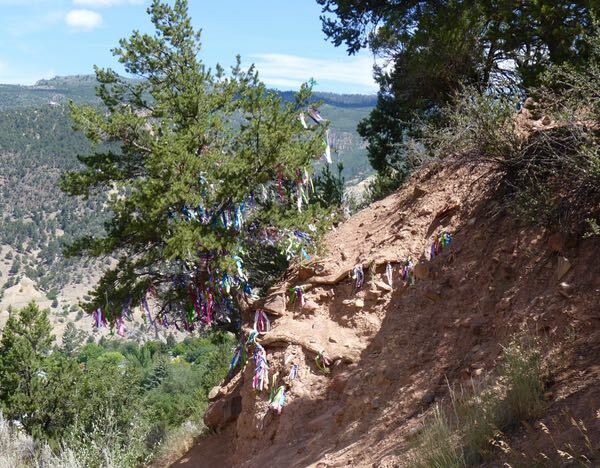 Along the trail, was a tree adorned with lots of colorful ribbons. Not sure what was the meaning of it though. 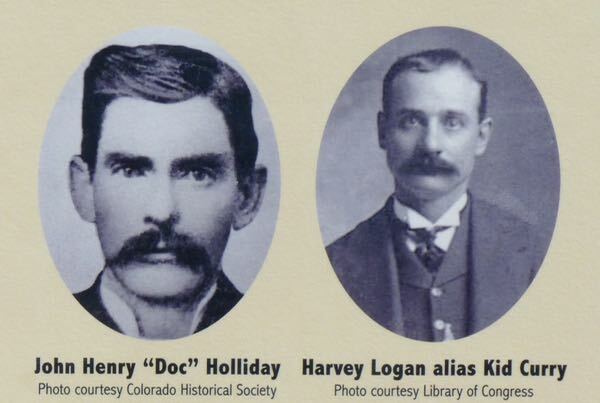 Trained as a dentist, but remembered as a gambler and quick on the draw, John ‘Doc’ Holliday was best known for his role with the Earp brothers in the shootout at the OK Corral in Tombstone AZ. Described by Wyatt Earp as “the nerviest, speediest, deadliest man with a six-gun I ever knew”. Ailing from tuberculosis, he came to Glenwood Springs for the soothing mineral waters and vapors of the hot springs. It did him little good as he died in bed six months later. 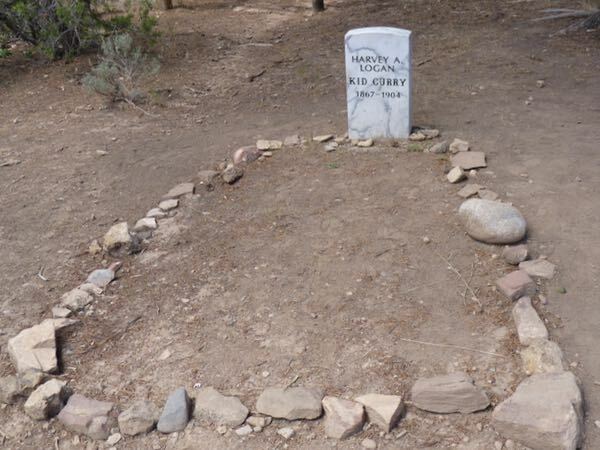 Harvey Logan, aka Kid Curry, met his end after a train robbery during which he was shot while making his escape. Severely wounded, and unable to flee, he committed suicide. His was a life of crime from his teen years, and he had been a member of the ‘The Wild Bunch’ gang along with Robert Parker aka Butch Cassidy and Harry Longabaugh aka The Sundance Kid. I love the history of these people. Many of the places I visit have intriguing history. That’s part of the interest and fun. I’ve seen a few pictures of Doc Holliday over the years (we live near Tombstone! ), but never noticed until I saw the one on your site . . . he looks a lot like my father did when he was young. My father’s mustache was not as bushy, and he shaved it off after he came home from WWII, but his eyes and the shape of his face were very similar. Eerie! That would be a bit shocking, for sure. One thing I learned about ‘Doc’ is that he was originally from the Valdosta GA area, and moved west to help his TB. Who would-a-knew?! The “ribbons” are prayer ties — a tradition of many Native Americans. The tree is usually at a sacred site (the reason it is sacred may be known only within the local community). Since this is on the way to an anglo cemetery, it could simply be that locals or others have adopted the idea? My first thought was the native prayer ribbons; but, they didn’t look like what I had seen before. Possibly an adaptation by locals as you suggested.